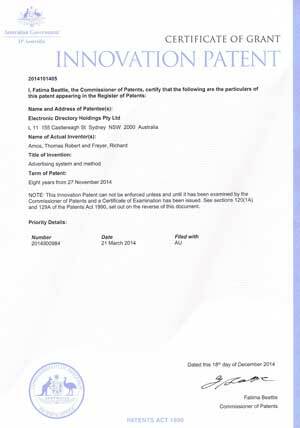 In 2014 AusAdvertising were granted a full innovation patent 2014900984 for a digital advertising system that disclosed the unique development by AusAdvertising of a themed and multi channel advertising system. The patent was a result of 3 years of research and development in the digital advertising area. The AusAdvertising system employs novel and very innovative ways to deliver the best and most effective product and service mix. This system facilitates a business, product or service snippet or ad or site to be found online ahead of the competitors using the same environment and digital mix. The patented system employs structured pull technology, geotargeted Adwords, themed landing pages, Social posts, AMP mobile technology and optimised websites. It then combines these structures with push EDM email, articles and broadcast services to deliver a superior service. AusAdvertising provides complete digital, broadcast and marketing solutions using our deep research, experience and insight to successfully deliver top online results. In the practical world by combining our patent technology with Google services such as Adwords and Adsense, themed landing pages, sponsored entries and links we tailor digital outcomes to deliver the best return for the advertising investment. From the moment any digital campaign goes live, AusAdvertising optimisation is the key to success. We analyse the ongoing performance of the campaign to ensure positive results. The Team at AusAdvertising will harness for you the power of the online marketplace. Expect to recoup a predictable return on investment from every marketing dollar spent. Developing a Return of Income (ROI) model, we can work with you to establish achievable goals specifically tailored to your unique needs and business. In the event that an agreed outcome is not achieved within the specified timeframe AusAdvertising may continue to develop your campaign until the agreed ROI target is achieved. So why not put us to the test. AusAdvertising provides accountability second to none. Find out more about our great offers, simply provide your name, email and phone number and one of our customer services agents will give you a call shortly.